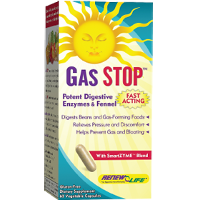 Gas STOP is an advanced formulation of digestive enzymes that assist the body in breaking down gas-forming foods, such as beans, raw vegetables, and certain grains. Many people lack the enzymes necessary to break down these foods. Taken with meals, Gas STOP can help prevent painful gas, bloating, and pressure.